Confession time. Until just a few years ago, whenever I heard the words butternut squash I envisioned the acorn squash. I was not much of a squash consumer other than zucchini and pumpkin. I was squash stupid. It was when Nicole and Andrew had us over for homemade butternut squash ravioli one evening that I became enamored with the lovely gourd. Since then, I’ve had several encounters with butternut squash soup, and I love it! Searching for recipes there are several variants in the supporting cast of ingredients and I am never sure which ones to try. 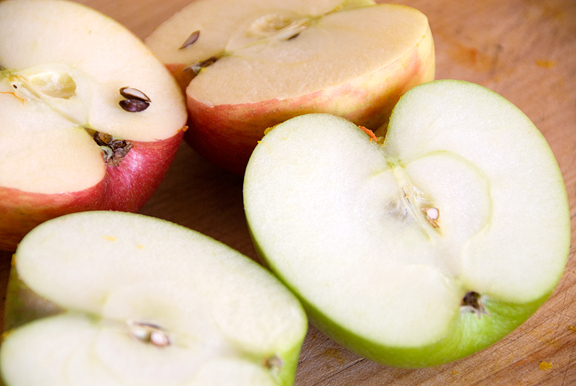 Yesterday I gave the apple variation a go, except I was shy a Granny Smith, so tossed in one of our snacking apples to boot. I also roasted my butternut squash. I love the sweet and nutty accents roasting can bring out in certain foods. However, has anyone figured out how to get that gel-like excretion from the rind off of your hands? It is ridiculously tenacious. The apples, shallots, and onion were simmered in chicken broth for a half hour. 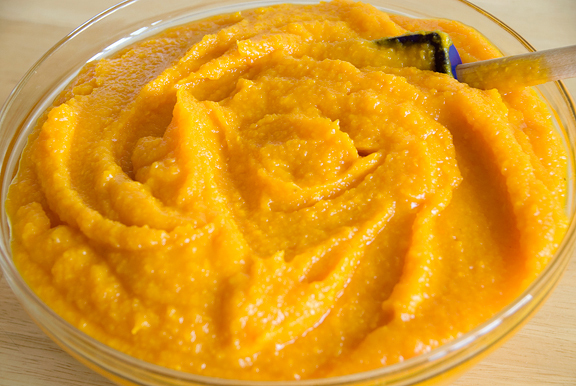 Meanwhile, I puréed the butternut squash. I had to snarf several cups of chicken broth from the pot to get the squash to purée properly – but it all goes in the soup eventually. When the apples and co. were soft, I drained off the broth, reserving it for later, and puréed the solids. Then everything got mixed together in a large pot: the squash, apples and co., and broth. Add salt and pepper for taste and the most important part – a half stick of butter. My justification: there is a lot of soup. The recipe I have written down calls for marjoram, but marjoram and I are not friends so I left her off the guest list. 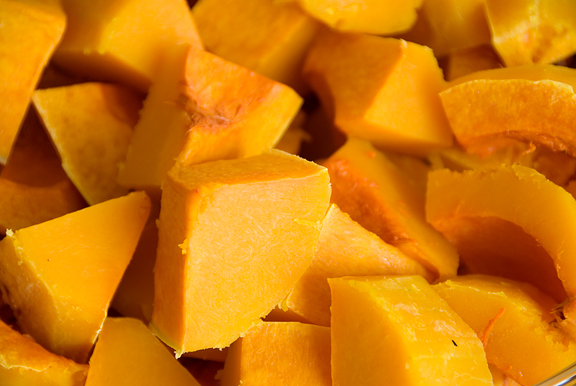 I find the color of butternut squash to be a breathtaking orange. It makes for terrific presentation on its own. But I can’t help embellishing it with some extra garnish for added flavor and eye candy. The soup is delicious, although I am curious to try a celery/carrot/onion grouping next time. 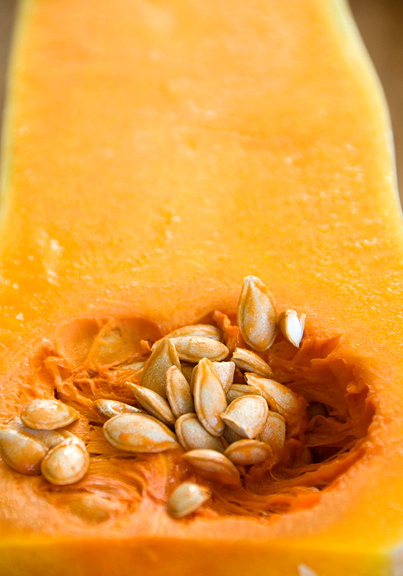 Cut squashes in half or quarters and scoop out the seeds. Roast in a 400°F oven for 45 minutes to an hour or until soft. Peel and chop the squash. 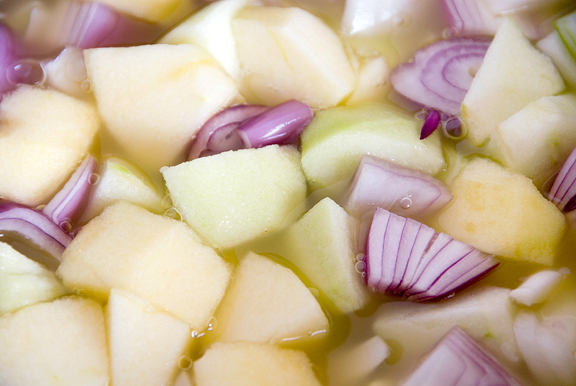 Boil onions, apples, and shallots in broth and simmer for 30 minutes or until soft. Purée the squash adding broth from the simmering pot as needed (I needed a few cups). Strain the apples, onions, and shallots from the broth and reserve the liquid. 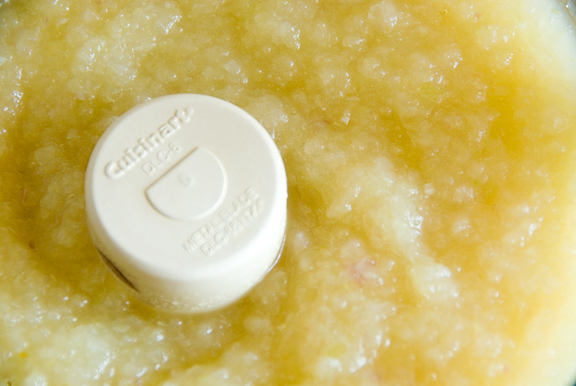 Purée the solids. Add both purées to the broth and mix well. Season with salt and pepper to taste. Add the butter and heat the soup until it just begins to simmer. Serve hot. The soup looks great!! I suggest using some salt (regular table top) in lieu of soap to get off the goo. It works for slimy yams! Looks good. Roasted butternut squash is a favorite of mine. I like the idea of adding apples to a roasted butternut squash! Mmmm, one of my all time favorite soups…we served it at my wedding. Looks great. I love all the photos you post of your recipe at various stages. I need to try making butternut squash soup! It looks mouthwatering and I love the bacon decoration! Kevin – I thought I’d like the apples too, but I think I might prefer a more savory version instead… it’s good, but I’ve had others that I like more. Ashley – thanks Ashley. 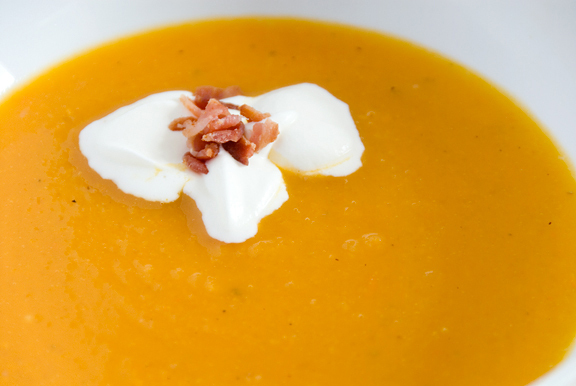 Bnut squash soup is easy peasy and so pretty and delicious. Love the soup! So did the company I served it to. I did make a few changes. The squash got “roasted” a little longer than planned and actually came out nice and browned which added an nice touch to the color of the soup. I sauteed the onions in some “butter” to brown them also and then added them and the apples and shallots to the broth. Kathie – mmm, nice changes. It probaby improved the recipe by a lot. 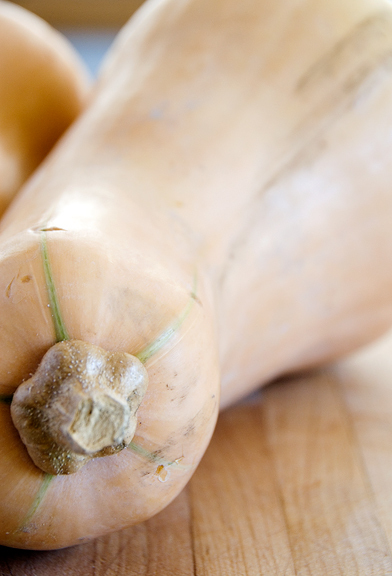 I love using butternut squash in soup. Your recipe sounds wonderful. In my recipe I add tomatoes and broccoli, but this sounds excellent also! Tasty Thoughts – oh, your version sounds great too! I love your version recipe when I made it. It tastes sooo good! By the way, I added bay leaves in the soup and it tasted soo rich! Thanks for sharing the recipe with us! Candied walnuts as a floating garnish has a certain appeal. Or you could toast walnuts in a skillet with chili spices.